Exciting news for young scientists! 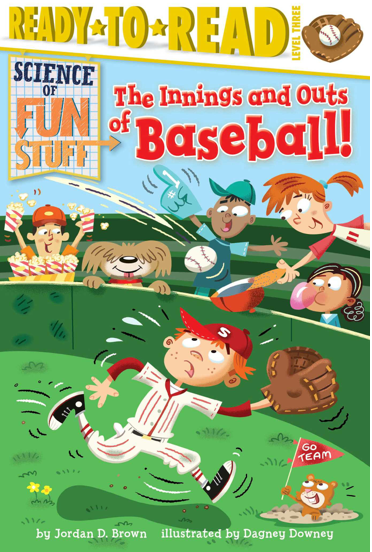 Simon & Schuster just published two children’s books I wrote for their new Science of Fun Stuff series.The Thrills and Chills of Amusement Parks and The Innings and Outs of Baseball. Both books are aimed at kids in Grades 1-4, and are filled with silly illustrations, and loads of fascinating facts. 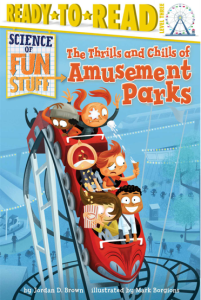 The Thrills and Chills of Amusement Parks helps kids understand the basic physics behind roller coasters, bumper cars, and “step-right-up” midway games. This book also presents the sweet, sweet chemistry behind cotton candy. (If you check out this link on Amazon, you can peek at the inside the first chapter.) 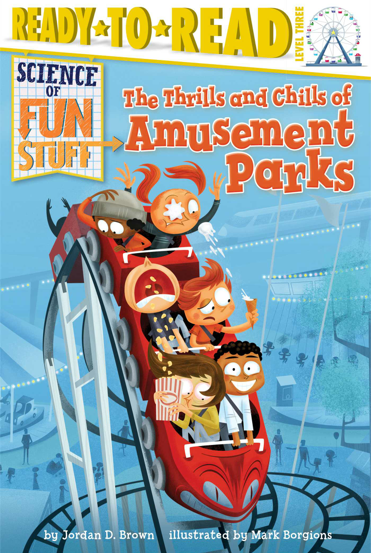 To help readers grasp “the forces behind the fun,” I explain Isaac Newton’s famous laws of motion and ideas about gravity, and show how they relate to the sciences of “Ahhhhhh!” “Whoooa!” and “I think I’m going to be sick!” The last section features amusement park trivia and a quiz. The Innings and Outs of Baseball explores the physics of homeruns, curveballs, the “sweet spot” of a bat and more. Readers learn such cool facts as the ball’s stitches rub against the air as they hurl through it—which causes friction and helps it fight the pull of gravity. Why is this important? For one thing, if baseballs didn’t have stitches that cause air resistance, then hitting a homerun wouldn’t be possible! A chapter on baseball experiments describes how scientists study superstar hitters, and even created robots that can pitch and hit. 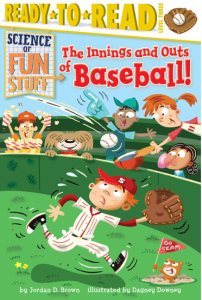 The last section features information about the history of baseball and a quiz. Posted in Catchall, children science books, science, science baseball, Way Cool Science Stuff | Permalink | No Comments ». Add yours! The prolific and talented Seymour Simon (“the dean of children’s science writers” – NY Times) invited me to contribute to his blog. My first entry is called “It’s a Small World, After All.” (Hoping I don’t get sued by either Disney or the B.L.C. 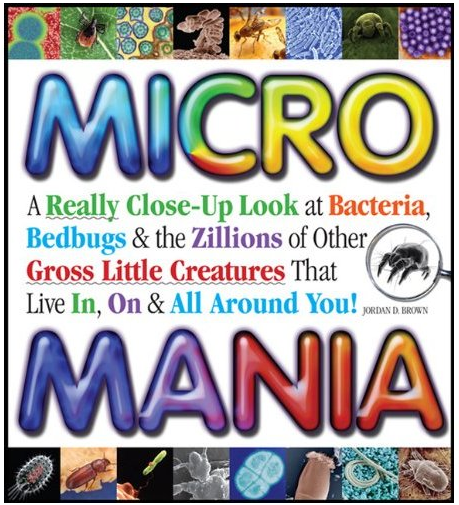 — Bacteria Litigation Consortium) In honor of Earth Day, I shared some of the dazzling facts I discovered when writing my latest book, MICRO MANIA. Posted in Bacteria, Catchall, children science books, gross facts, Jordan D. Brown, Micro Mania, Way Cool Science Stuff | Permalink | No Comments ». Add yours! Last month, I was asked to be the “visiting author” at a local elementary school, to talk about a new kids science book I wrote — MICRO MANIA: A Really Close-Up Look At Bacteria, Bedbugs & The Zillions Of Other Gross Little Creatures That Live In, On & All Around You! As part of my talk to the 3rd grade classes, I showed a short music video, featuring a lyric I wrote to the tune of the “Star-Spangled Banner.” The song is sung from the point of view of all the invisible critters that surround us, many of which help us survive…May it inspire you to wash your hands regularly — but not turn you into a germaphobe! Posted in Bacteria, Bedbugs, Catchall, children science books, gross facts, Humor and Comedy, Jordan D. Brown, Micro Mania, Way Cool Science Stuff | Permalink | No Comments ». Add yours! I hope you (and the trillions of bacteria in your gut) all had a terrific Thanksgiving! In his opening acknowledgements, author Jordan D. Brown thanks his editor “for always pushing me to make it ‘grosser.’“ He more than followed her advice. From explaining the nature of bacteria to the flatulence of whales, this extremely readable book will be appreciated by the typical middle school student as well as more mature readers. Scientific vocabulary is used appropriately and in context. The roles of microbes in real-world environments such as kitchens, bathrooms, playgrounds, and pets are discussed, and practical applications are given. The photography is very good. Hands-on activities for extended, open-ended explorations are suggested with clear directions and safety considerations. I recommend this book for outside reading or as a reference text in a middle school library. If you enjoyed the book, too, please feel free to post your review on Amazon’s web page. Posted in Bacteria, Bedbugs, Catchall, children science books, Micro Mania, My Latest Work, Way Cool Science Stuff | Permalink | No Comments ». Add yours! A few weeks ago, my mother sent a fascinating article from my hometown newspaper, THE BUFFALO NEWS, to my 8-year-old son, Finian. It was about THIS curious creature…. A star-nosed mole (as I’m sure you knew, right?) Anyway, the article was written by Gerry Rising, whom I’ve known since I was a little boy growing up in Buffalo. Gerry was a colleague of my father’s at the University of Buffalo. One of Gerry’s many pursuits is writing a weekly nature column for the Buffalo News. I contacted Gerry to tell him how much Finian and I enjoyed his star-nosed mole piece — and happened to mention that I had a new kids science book coming out, MICRO MANIA. Gerry not only expressed interest in the book – but reviewed it in his column on Sunday, November 8. I was very pleased to read that Gerry liked it, and learned from it. 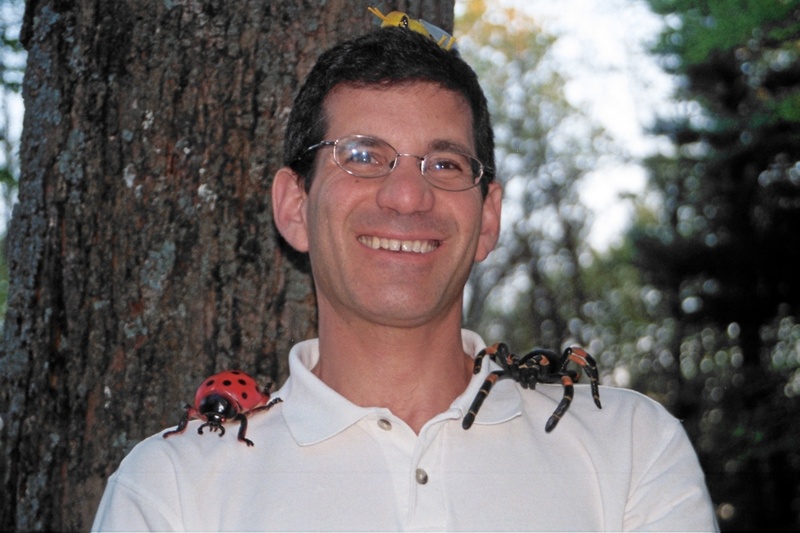 I appreciated that he understood my goal was not only to tantalize with gross details and irreverent humor, but to educate children of all ages about “the little guys” with which we share the planet. Any science enthusiasts who’d like to read more of Gerry nature columns (he’s written hundreds), should check out this archive. Posted in Bacteria, Bedbugs, Catchall, children science books, gross facts, Micro Mania, My Latest Work, Way Cool Science Stuff | Permalink | No Comments ». Add yours! Don’t you just love that new book smell? I do. Especially when the new book is one written by me! It’s a new science book for children 6 and up, and is filled with fascinating facts, irreverent humor, and loads of disgusting photographs of creepy, crawly critters, many of which are invisible to the eye. When I was writing the book, I was urged by my editor to “make it grosser.” And so I did. In the coming weeks, I’ll be posting some of the tidbits from this book here, and invite any of you to post fascinating facts about the “little guys.” My goal was to both inspire children to appreciate the many tiny creatures that inhabit the world, and to remind folks that many of the little animals play a critical role to life on Earth. Yes, yes, when I was writing the book, I became somewhat of an obsessive hand-washer. But now that phase has passed, much to my relief. I also noticed that it’s now on Amazon.com, Barnes and Noble.com etc… and Halloween is just around the corner…perhaps just the right gift for any kids who enjoy reading enGROSSing books. 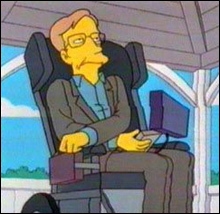 The “black hole” got an enormous marketing boost from the distinguished American physicist John Wheeler, who frequently wrote and lectured about this phenomenon. Based on some quick research, I learned that Wheeler didn’t coin the term “black hole” himself, but was one of its champions. Hope the rest of your summer is a “big bang”! Posted in Catchall, Way Cool Science Stuff | Permalink | No Comments ». Add yours!